Designs developed in Soviet years were so forward-looking that modern Russia still uses many of the ideas created in that era when creating new-generation weapons. The original ideas were generated by an outstanding crop of Soviet weapons designers, one of whom was Sergei Nepobedimy, designer of the Strela and Igla missiles and numerous defense systems. At the end of the Second World War, as the young Sergei Nepobedimy was concluding his degree in munitions engineering and technology at the Moscow Bauman State Technical University, something happened that would have a lasting effect not only on Nepobedimy’s life and career but also on the future of Soviet rocket science: The young graduate was offered a job with the KGB. Back then, offers like that were hardly ever refused, all the more so since working with the KGB had a lot of prestige attached to it. However, the young engineer went against the grain and joined the Kolomna Engineering Design Bureau instead, later becoming its chief designer. These days the bureau is known all over the world thanks to the Iskander-M and Igla missile systems it developed. Sergei Nepobedimy’s commitment to his work was legendary: He attended every single test launch of his missiles, sometimes travelling 250 miles to the test range. Mind you, there was a test launch almost every week, sometimes even more often. When testing was over, Nepobedimy calculated that he had clocked the length of the equator on his journeys to test ranges. During one of those tests, that of the Shmel anti-tank missile, there was an incident that prompted the introduction of special psychological training for servicemen operating complex weapons. During the test, Nepobedimy was approached by a soldier, who told him that his hands were shaking out of fear of doing something wrong and thus causing damage to the socialist state by destroying an expensive missile, although officially soldiers could not be held liable for any damage caused. That admission triggered the introduction of a new requirement whereby all servicemen involved in missile launches had to undergo special psychological training first. The fear of inflicting huge costs on the state did not mean that the cost of Soviet weapons was prohibitive or that designers could not keep an eye on the pennies. Indeed, the technology produced during this era show that the opposite was true, largely because one of the key concepts underlying Soviet technologies was simplicity combined with efficiency. It is little known that the cost of the legendary Malyutka (“Baby”) guided missile was reduced to that of a black-and-white TV set, at 500 rubles. This despite the fact that the missile featured several technological innovations and used advanced electronics and plastic components in its warhead. In addition, its body was made of plastic, which in the 1960s was an advanced step even for the U.S. 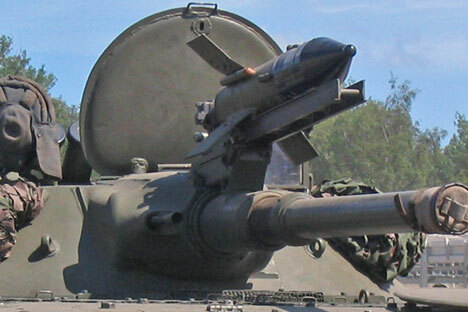 Thanks to its low cost, the Soviet Union made up to 40,000 Malyutka missiles a year. Unsurprisingly, there are still some 200,000 of these missiles stored in army depots in various parts of the world. Another curious and little-known fact associated with Nepobedimy’s designs also involves the Malyutka, as well as China and fashions. In the 1960s, under Soviet leader Nikita Khrushchev, Moscow’s relations with China soured. That affected the imports of Chinese silk, which all but stopped. However, silk was used to make the wiring via which the Malyutka missile was guided. For a long time, Nepobedimy struggled to find a substitute for silk, until one day at a meeting at work he spotted a polyester shirt on one of his colleagues. The fabric that the shirt was made of was called Lavsan, an abbreviation for the Laboratory of Macromolecular Compounds under the USSR Academy of Sciences. And so a fabric that was used to make shirts and dresses became a “shirt” for Malyutka. During his career, Nepobedimy designed a number of well-known weapons systems such as the Oka, Tochka-U, Khrizantema, Strela, and Igla. He also founded a whole new area in weapons design: active defense systems for tanks, helicopters and ballistic missile silos.